Carambola Resort is one of our favorite places to go on St Croix. The beach is one of the best on the island and the restaurants have delicious food. My family and I have a house in St Croix but we visit the beach and restaurants at Carambola all the time when we're on the island because they're so nice! 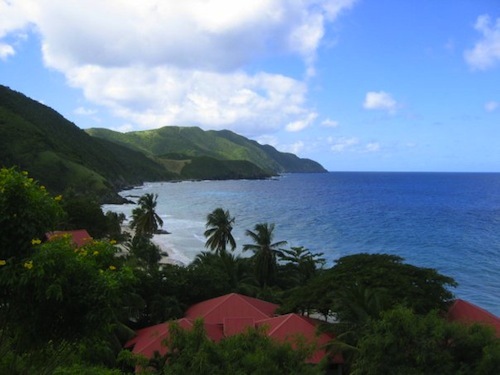 Carambola Beach Resort has one of my family's all-time favorite St Croix beaches. The resort is gated, but if you tell the guard you're going to the restaurant, they let you right through (shhhh that's a little family secret! ), otherwise you have to park farther away and walk down. The waves are slightly larger than at some of the other beaches on the island, but it makes the perfect conditions for riding waves, skim-boarding, and other ocean fun! My family and I have been going to Carambola for many years. 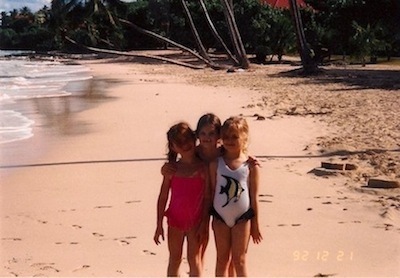 Me and my cousins at Carambola Beach Resort when we were little. For the best swimming and the softest sand, we always walk to the very far left end of Carambola beach. Not only is the water great, but you can have so much fun just playing in the sand. 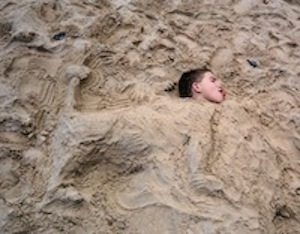 We buried my brother's friend in the sand and transformed him into a dog! My uncles and brother LOVE golf, and the Carambola golf course is their favorite course on the island. Set admist the St Croix rainforest, Carambola Golf Course is one of the most picturesque Caribbean courses you will find. Along with the beautiful beach and top-rated golf course, Carambola Resort also has some great island activities to choose from. If you're interested in St Croix snorkeling or scuba diving, there is a dive shop located right on Carambola beach! It's called Sweet Bottom Dive Shop. They have snorkeling equipment and can teach you how to scuba dive with no prior experience needed. 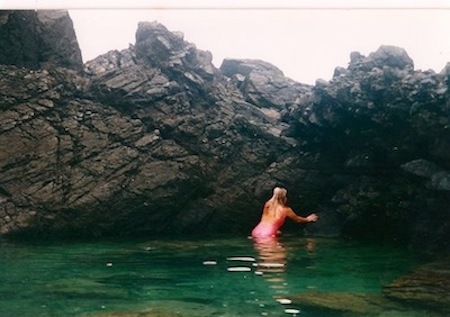 While there are many fun things to do at Carambola Resort, my personal favorite is going on the hike to the Annaly Bay Tide Pools. 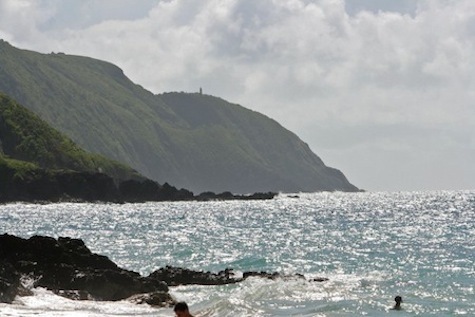 Carambola Resort is the starting point for this hike and it's one of the most beautiful hiking trails on the island. The trail winds though rainforest-like vegetation, provides spectacular views of the Caribbean Sea, and ends up at incredible naturally formed tide pools that are unlike anything else on the island. You can read more about this hike and see pictures of the tide pools at the St Croix activities page. Carambola Resort has two great restaurants. One has a more casual island atmosphere and the other is for a fine-dining experience. The more casual restaurant/grill is connected to the Flamboyant Beach Bar (a very fun bar by the way!) You can stop in a get a quick bite whenever you want to take a break from the beach or pool. The food is really yummy and you can sit out on the terrace overlooking the Caribbean Sea while you eat. Plus the Flamboyant Beach Bar serves delicious Cruzan frozen beverages and cold beers, so you can really kick back and enjoy your Caribbean vacation to the fullest! The second restaurant is somewhat fancier and they have the most delicious Sunday brunch! My family and I eat brunch here at least once every time we visit St Croix. Everything is really good but my favorite are the crab legs. Yummmmy! 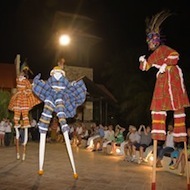 And on Friday nights, Carambola Resort hosts the famous Pirates Buffet & Mocko Jumbies Show. There is a delicious buffet with crab, shrimp, prime rib etc along with a bunch of local dishes. And at around 9pm, the Mocko Jumbies start performing! A “Mocko Jumbie” is a spirit or guardian that wards off evil and protects the people. The Moko Jumbie is originally from Africa. He wears tall stilts and colorful costumes and is celebrated in St Croix as part of the cultural heritage of the Caribbean. After the Mocko Jumbies perform for about 20 minutes, the band or dj starts playing music for dancing and general island fun! 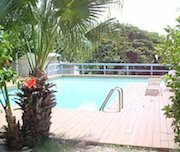 Carambola Resort is one of my family's favorite places to go on the island, whether it's for fun in the sun or great food and entertainment. But if you want to check out the buffets, be sure to make a reservation because they can fill up quickly!